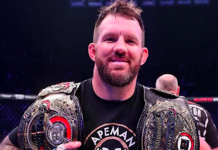 After their massive San Jose card with Bellator 206, Bellator MMA returns with a doubleheader of a weekend to determine the finals of their heavyweight Grand Prix. Starting things off with Bellator 207, the main event featured the first of the two semi-final matchups. But there was some great action that preceded the battle of big men. The first fight of the main card was a lightweight prospect battle between Carrington Banks (7-2) and Mandell Nallo (7-0). After a competitive first round that saw Nallo land the better strikes, Banks would find success in the grappling but suffer a scare when Nallo latched on a tight anaconda choke. As the second round started, Nallo wasn’t wanting to waste any time and that he did not. As the first minute ticked off the clock, Nallo came in with a perfect step knee that connected cleanly for the knockout. The fight that followed also took place in the lightweight division. Returning to action was the son of Kimbo Slice, Kevin “Baby Slice” Ferguson Jr. (3-2) who took on Corey Browning (4-2). There’s one really good way to describe this fight and that’s “rollercoaster”. After a wild and persistent wrestling pursuit from Ferguson in the first, late into the round, Browning would end up sweeping Ferguson to get a modified crucifix-like position where he could land some solid shots before the bell rang. Round two started off with Ferguson landing hard on Browing with a right-left punch combo only to charge in and get dropped. Ferguson was able to reverse Browning’s momentum to get on top and try to work for an arm triangle into a rear naked choke. As the exhaustion built for Baby Slice he would lose position which led to Browning unloading punches until the referee stopped the action. The bout sandwiched in the middle of the card was one that had welterweight Grand Prix implications as the winner would become the alternate in case of an injury to any of the other tournament competitors. It was former title challenger and UFC/Strikeforce veteran Lorenz Larkin (20-7) vs Ion Pascu (18-9). Larkin would essentially impose his will on the feet landing his strikes of choice with Pascu attempting to get things to the ground whenever the distance was closed. 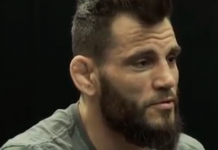 It was until mid-way through the third that he finally found a takedown where he would hold it until he worked for a late leg lock submission to no avail. Like the main event, the co-main event also featured the heavyweights as Roy “Big Country” Nelson (23-16) took on Sergei Kharitonov (29-7). The fight started out with plenty of volume from each fighters using their jabs to nice effect while searching for the big overhand shots. A takedown attempt would be stuffed by Kharitonov and lead to an illegal knee that caused one point deduction for Kharitonov. Nelson would regain some momentum pretty quickly after as the two traded. As the round came to a close Kharitonov began to land much harder and cleaner with his punches before a barrage of uppercuts to a knee closed the show right at the very end of the round. Main event time! 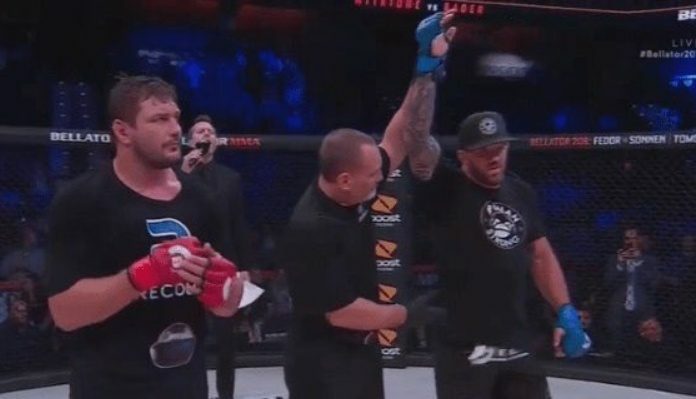 As the first fighter to reach the Bellator Heavyweight Grand Prix finals was decided when Matt Mitrione (13-6) took on the Bellator light heavyweight champion Ryan Bader (26-5). Within 20 seconds, the champion would get the takedown and he would dominate the first round on the mat from there. The second round starts and Mitrione looks a bit more cautious but quickly attacks before getting taken down again where he will stay. Ground and pound and brief kimura attempts threaten Mitrione but he survives to see the third. 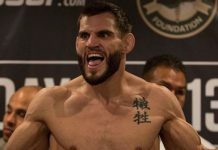 In the third and final round, the takedown would come even quicker as Bader got the action to the mat within 10 seconds where he continued to do the work he did the previous two rounds. 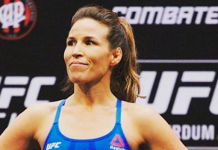 Bader will now face the winner of tomorrow night’s Bellator 208 main event between Fedor Emelianenko and Chael Sonnen.